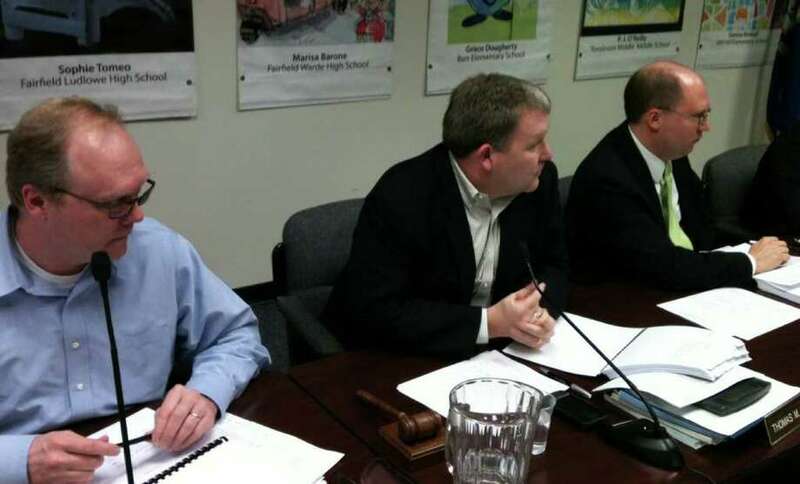 Board of Finance members, from left, Kevin Kiley, Chairman Thomas Flynn and Robert Bellitto Jr., at Thursday night meeting where a $273.3 million budget was backed for 2012-13. The Board of Finance unanimously approved a $273.3 million total spending package for the 2012-13 fiscal year Thursday -- $332,607 more than the budget approved earlier by the Board of Selectmen. The proposed $273.3 million budget, which rises 3.9 percent, or $10.3 million, from the current budget of $263.1 million, now heads to the Representative Town Meeting for final action. The RTM can reduce the proposed budget, but cannot add money. The impact of the finance board's actions Thursday on the tax rate for the next fiscal year, which begins July 1, wasn't immediately known because Town Fiscal Officer Paul Hiller has to take into account an $8.1 million decrease in the town's grand list. That decrease is due to revised property assessments that came about after property owners challenged new assessments. But the tax increase in 2012-13 -- based on the finance board's addition of $332,607 Thursday and the selectmen's addition on Monday of $450,350 -- is expected to exceed the 4 percent figure associated with First Selectman Michael Tetreau's initial proposed budget of $272.6 million. "I'm very surprised with where spending is going with increases added at the Board of Selectmen level and Board of Finance level," Selectman James Walsh said after Thursday night's meeting. "The first selectman did not put forward to us an honest budget." Tetreau, speaking during Thursday night's meeting, made a motion to restore a $250,000 cut to the Board of Education's proposed budget that had been approved by the selectmen Monday. That cut had dropped the school board's proposed budget to $148.6 million, a 2 percent increase over its current budget of $145.7 million. Tetreau said the surplus from the overall current town budget might be $1.5 million on June 30, which he said would be $800,000 to $900,000 more than town officials had predicted. He said that is partly due to revenue from the Town Clerk's Office and interest on back taxes totaling about $350,000 more than town officials had predicted, and, on the expense side, an anticipated $100,000 surplus in the private school bus transportation account and from $100,000 to $150,000 in excess money from past encumbrances that the school board hadn't spent. "The Board of Selectmen didn't have this information on Monday when we voted," Tetreau told the Board of Finance. Hiller added that the town spent little money on snow removal this year, and Tetreau said Fairfield fared better than most towns in damage from Tropical Storm Irene. Tetreau said he planned to offset the $250,000 addition to the school board's proposed budget by withdrawing plans to add $250,000 to the town's surplus, or rainy day, account in the 2012-13 fiscal year, an idea later approved by the finance board. Finance board member Kevin Kiley objected to Tetreau making the motion to restore $250,000 to the Board of Education's proposed budget because the first selectman is an "ex-officio" member of the finance board. Tetreau withdrew the motion, Kiley made the motion instead and it was approved on an 8-1 vote, with finance board member Robert B. Bellitto Jr. casting the only vote in opposition. Tom Flynn, chairman of the Board of Finance, said he supported the $250,000 restoration, but was "very uncomfortable with the process, that this information regarding the general fund came so late in the game." The finance board later voted to add about $785,000 in pension contributions for town and school board employees and offset about $452,000 of that amount through cuts to various town departments -- most of which involved requests for new equipment at the town's Department of Public Works and H. Smith Richardson Golf Course. - Adding $334,048 to a pension fund for Board of Education employees, to bring funding up to this year's level of $1.7 million. That brought the school board's proposed budget up to $149.2 million, an increase of 2.4 percent, or $3.5 million, over its current budget. - Adding $451,220 to a pension fund for town employees. - Adding $250,000 to the Board of Education's proposed budget. - Reducing projected revenue from interest and dividends on town investments by $100,000 -- from $850,000 to $750,000. - Reducing the Legal Services budget by $63,000 -- from $603,000 to $540,000 -- so it matched the current Legal Services budget. - Eliminating $1,000 for the Land Acquisition Commission because the town is not in a financial position to investigate land purchases. - Reducing a contribution of $39,000 to the Fairfield Theatre Co., with the idea of having that expense absorbed by the town's Department of Public Works (a vote to increase the DPW budget by $39,000 wasn't made). - Transferring $561,483 from the town's contingency account to payroll lines in the Fire Department's proposed budget due to the firefighters' contract being settled. - Eliminating the $250,000 contribution to the town's surplus, or rainy day, fund. - Reducing $2,000 from the Board of Finance's fees and professional services account. - Reducing $10,000 from the Fire Department's maintenance and repair materials account. - Reducing $27,501 from the Fairfield Public Library's materials account to bring funding to this year's level. - Eliminating $49,420 for a fairway mower at the H. Smith Richardson Golf Course because two fairway mowers were replaced last year. - Eliminating $19,240 for a heavy-duty utility vehicle at the golf course. - The finance board also endorsed the selectmen's plan to give $846,435 to nonprofit organizations in 2012-13 (the finance board excluded the Fairfield Theatre Co.), but not without considerable discussion about whether town taxpayers should be funding those groups at all. - And the finance board set salaries for the town's two registrars of voters (considered part-time) over the next four fiscal years. The percentage increases for the officials -- now paid $32,225 -- were 0 percent, 0 percent, 3 percent and 0 percent. The finance board also voted to add $19,819 to the town's Water Pollution Control Authority's retirement account, but the WPCA is a self-funding entity that exists outside the town's operating budget. Andrew Brophy is a freelance writer.